Here are kids science experiments and activities that will help you teach children everything they need to know about the world of plants. 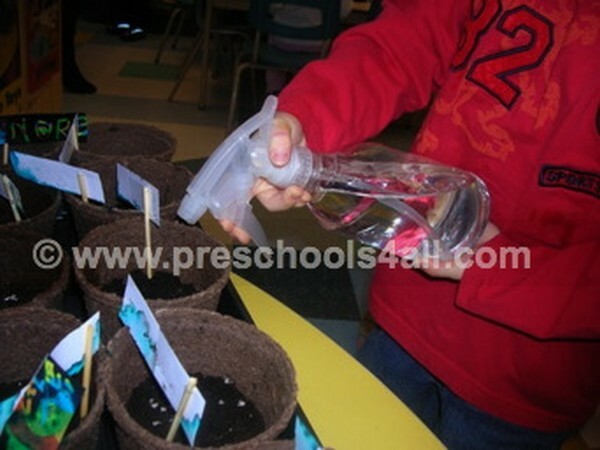 Kids Science Experiments - Planting Time! Buy some seeds and soil and simply plant them. Make sure to place your planting pot in a sunny spot. I also got my son a water squirt bottle since they are fun to use and are a great fine motor activity. Every morning my son gets up and checks his plants. While he waters them he tells them how much he loves them. It is the sweetest thing in the world! In class we use Farm Vue. It is a fantastic way to see the seed grow into a plant from all angles right before your eyes. It includes soil mix, a self-watering grow unit plant identification labels and 3 packets of top quality Super-Grow seeds. Plants need lots of sun, water, soil and LOVE.People and Nature are closely connected. Nature provides us with food, shelter and oxygen and in exchange our job is to protect it and preserve it. Question: How are these two groups the same? How are they different? Answer: Both groups are living things. They breathe and need 'food' to survive. Plants can not move around. Sort card images of animals and plants. Make a statement and ask the children to give it a thumb up (if it is true) or a thumb down (if it is false). "Some leaves can change colors." Discuss all kinds of plants with the children such as: Trees, vines, shrubs, flowers and so on. Question: What do plants need in order to grow? On your nature walk make observations about the variety of plants growing at the park. Are all the trees the same size? Do they all have the same type of leaves? How do they differ? Collect leaves and use them in an art activity of leaf rubbing. Simply place the leaf underneath a plain paper and use a crayon to rub over it. The parts of a plant are: Roots, stem, leaves and blossoms. The parts of the tree are: Roots, trunk, branches, leaves and blossoms. After reviewing the parts of the tree/plant, give the children a black and white photo copy of a tree and/or plant. Ask them to color the trunk brown, the leaves green, the blossoms pink and so on. Question: Ask the children why? Why do plants have roots? Stem? Leaves? and Blossoms? Answer: Roots hold the plant in place, they carry water and minerals from the soil to the plant. Stems hold up the leaves and flowers. Tiny tubes in the stems carry water and food to the rest of the plant. Leaves make food for the plants. Flowers carry the seeds for the plants. Place in a sunny spot. Add a fresh cut celery stalk into the water. Leave overnight.What happened to the celery stalk? All plants begin as seeds. They grow into plants. They blossom and produce flowers, the flowers produce new seeds and they cycle begins again.